Fill in your details below and we will let you know within 24 hours if we can get Roll For It! Deluxe to you with haste! Roll For It! 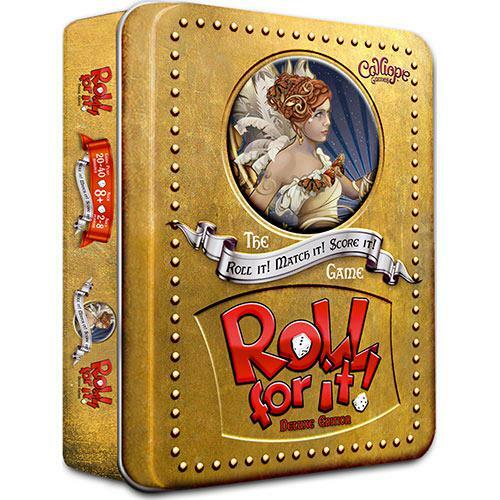 Deluxe combines the fast-paced action of Roll For It! with the beauty of Calliope's iconic artwork. The Deluxe Edition combines the contents of both the red and purple games and now supports 2-8 players ages 8+ and plays in 20-40 minutes. Included are 48 stunning dice, a crushed velvet dice bag embroidered with the Roll For It! logo, and 60 exquisitely detailed cards featuring your favorite Calliope characters. The Deluxe Edition is presented in a beautifully embossed tin with a hinged lid—the rich flocked interior of which doubles as a dice tray—and fits perfectly into your back pocket, making the Roll For It! Deluxe Edition the perfect choice for gamers on the move. In Roll For It!, players try to score 40 points by rolling dice and matching the results to cards of specific point values. Each roll presents the player with new opportunities and fun decisions to make. The rules are simple—Roll For It! Match It! Score It! But look out! Other players may steal the card you’re shooting for… So hurry, pick up the dice and Roll For It! Fun, Fast, and Exciting: Players take turns rolling dice, trying frantically to allocate dice to the Roll For It! cards and steal victory points from their opponents! An average game takes 20–40 minutes to play, making it the perfect game at any time! Luck & Skill in One Game: Roll For It! takes the luck of the dice and adds decision-making skills utilized in resource management games. Beautiful: Featuring the art of Echo Chernik, the Roll For It! Deluxe Edition is presented with pearl and translucent dice, an embroidered crushed velvet dice bag, and a flocked embossed tin that doubles as a dice tray. Portable: Roll For It! is very compact and travels easily, making it the perfect game to play at restaurants, while out camping, or anytime people are on the move.